Internet will soon reach the outer space. At time when internet is spreading all across the globe, effort is being made to provide access of internet on the outer space. 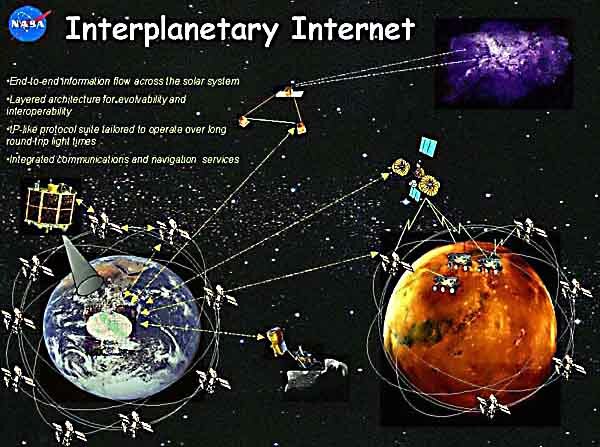 Vinton Cerf , one of the founding fathers of the Internet who is Google's vice president and chief internet evangelist, says that the proposed "interplanetary" Internet may allow people an ability "to access information and to control experiments taking place far away" from Earth, yahoo news reports. It implies that internet will reach where no network has ever gone before. It's being said that a team of engineers/technicians at the California-based Jet Propulsion Laboratory would soon complete a key part of the project and would be establishing standards for space communications like those for Internet down the three years. Cerf says "The effort is now reaping fruit and is on track to be space qualified and standardized in the 2010 time frame. "Eventually we will accumulate an interplanetary backbone to assist robotic and manned missions with robust communication." The number of Internet users has subsequently grown 20-fold in the past decade to about 1.2 billion people this year, with the number of computer servers rising from 22.5 million to 489 million, he quips. He also hopes "millions and billions of Internet-enabled devices" may emerge, with items to cover nearly all home appliances such as televisions, radios, kitchen equipment, fax machines and printers, refrigerators and bathroom scales in future.